The death occurred peacefully at the pallaitive care unit of the Western Hospital, on Sunday, March 24, 2019, with his loving family by his side, of Emanuel Joseph (Mano) Richard of Tignish, age 91 years. Beloved husband of the late Mary Ellen (nee Buote) Richard, who predeceased him in 1998. Born at Tignish, on May 21, 1927, he was the son of the late Henry and Phyllis (nee Martin) Richard. Lovingly remembered by his children: Gary (Gale) Richard of Toronto; Philip (Brenda) Richard of St. Roch; Stephen Richard of Fort McMurray; Barbara Richard (Leonard) of St. Roch; Dede Richard (Claude) of St. Roch; Blaine Richard (Maudie) of Tignish; Edna Martell (Eric) of Georgetown; Joey Richard (Allison) of Toronto; Mary Richard (Cyril) of Ascension; and Jenny Clements (Brian) of Alberton. He will be sadly missed by his 14 grandchildren, 15 great-grandchildren and one great-great-grandchild. He is also survived by a sister, Mildred Smith of Halifax, a daughter-in-law, Karen Richard of Wellington, and by his nieces, nephews and friends. He was predeceased by son Neil Richard in 2014, a granddaughter Bonnie Richard and by friend Doris Gaudet. 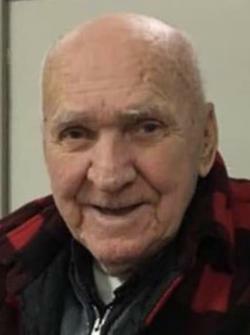 Resting at the Rooney Funeral Home and Chapel, Alberton, for visitation Wednesday evening 6:00 to 9:00 p.m. Funeral Thursday morning from St. Simon and St. Jude Church, Tignish, for funeral mass at 10:30 a.m., Rev. John Molina, celebrant. Interment later in the church cemetery. As an expression of sympathy, memorials to the Western Hospital Equipment Fund would be gratefully appreciated.